Extraction by subcritical and supercritical ethanol has been applied to many materials for the recovery of useful products from them. The treatment of coals and oil shales with these solvents may yield liquid fuels and many plant biomass materials are sources of bio-active products when subjected to extraction with ethanol at the named conditions. 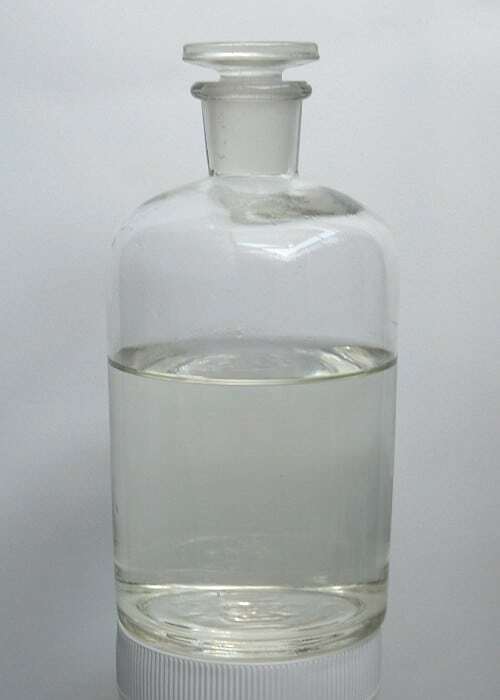 The solubility of the prospective solutes is, therefore, of importance, and the solubility parameter of the ethanol solvent is useful for its estimation. Ethanol at ambient conditions has a highly hydrogen-bonded structure, which is destroyed to an appreciable extent as the temperature is increased. This phenomenon reduces its permittivity and makes it less polar and tight, and facilitates the dissolution of non-polar substances in it. But the increased temperatures do not detract from the dipolarity and hydrogen bond donation and acceptance abilities of this solvent so that it also dissolves polar solutes. The total (Hildebrand) solubility parameters, δH, has often been used for the estimation of solubilities. The difference between the solubility parameter of the solvent, δHE, and that of the solute, δHS, should not exceed 4 MPa1/2 for appreciable solubility to ensue. A more detailed estimation of the solubility is the use of the partial (Hansen) solubility parameters: δd for dispersion interactions, δp for dipolar interactions, and δhb for hydrogen bonding. Such quantities are known for many potential solutes. Subcritical liquid ethanol extends along the liquid-vapor equilibrium line from the normal boiling point 351.4 K to the critical point 514.1 K. Over this range its Hildebrand solubility parameter is derived from the usual expression: δH = [(ΔVH(T) − RT)/V(T)]1/2, where ΔVH(T) is the molar enthalpy of vaporization and V(T) is the molar volume, all being temperature-dependent. The molar enthalpy of vaporization and the density ρ of liquid ethanol are well known as functions of the temperature, yielding the total (Hildebrand) solubility parameters of liquid ethanol. It follows the quadratic expression: δH/MPa1/2 = 28.39 + 6.815×10−3(T/K) – 5.2385×10−5(T/K)2, diminishing with increasing temperatures, from 26.14 at 298.15 K to 24.25 at the normal boiling point Tb (351.4 K) to 17.55 just below the critical point Tc (513 K). Above the critical temperature Tc the enthalpy of vaporization is meaningless, and the solubility parameter must be estimated from the configurational internal energy: δH = [−U(T,P)/V(T,P)]1/2. 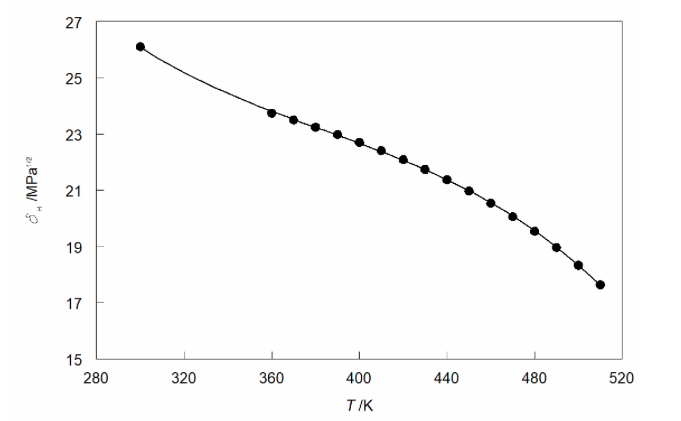 The Soave-Redlich-Kwong equation of state provides the configurational internal energy and U and V depend on both the temperature T and the pressure P. In terms of the reduced temperature Tr = T/Tc and reduced density ρr = ρ/ρc the total solubility parameter of supercritical ethanol is: δH/MPa1/2 = 7.31[1 + 1.410(1 − Tr1/2)] Tr−1/4 ρr. The main dependency of δH is a proportionality to the reduced density ρr, the effects of the temperature-dependent quantities being small. 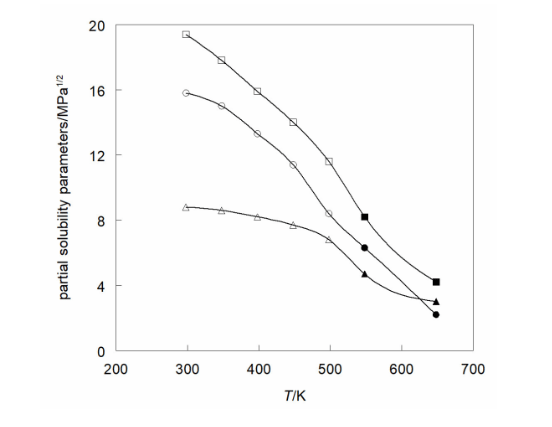 At three supercritical temperatures, 548 K (●), 623 K (▲), and 673 K (◼) the values of δH increase as a function of the pressure, but are much smaller than those for subcritical ethanol. The total (Hildebrand) solubility parameter is related to the partial (Hansen) parameters as: δH2 = δd2 + δp2 + δhb2. At elevated temperatures and pressures the partial solubility parameters vary with the molar volume according to expressions that involve those for the reference conditions (ambient temperature and pressure): for dispersion δd ref = 15.81 MPa1/2, for polarity δp ref = 8.80 MPa1/2, and for hydrogen bonding δhb ref= 19.43 MPa1/2 and the reference molar volume is Vref = 58.7 cm3 mol−1. The relative sizes of the partial solubility parameters are δhb (squares) > δd (triangles) > δp (circles) and they diminish as the temperature is raised, but for supercritical conditions (at 20 MPa, black symbols) they increase with the pressure. According to Hansen, the solubility sphere in three dimensions with a radius Ra describes whether the solubility of a solute (subscript S) in ethanol (subscript E) is good or not: (Ra)2 = 4(δdS – δdE)2 + (δpS – δpE)2 + (δhbS – δhbE)2. Values of the parameters for the solute that provide squares of the differences that reside inside the sphere denote good solubility and outside it denote poor solubility. Desulfurization is one aspect of the application of supercritical fluids to coals. Chinese coals are rich in sulfur, and a high ranking coal with 4.0 wt% sulfur was treated with supercritical ethanol at 673 K and 12 MPa. Desulfurization of Thai low-ranking coal requires the addition of potassium hydroxide to the supercritical ethanol and up to 48% of the sulfur could be removed at 623 K and 8.3 MPa of supercritical ethanol. The creation of liquid fuels from coal is another aspect: the conversion of South African coals to liquid and gaseous products by extraction with ethanol at 723 K and 20 MPa resulted in 25.5 % conversion. Supercritical extraction at 673 K with ethanol at 11.9 MPa of Illinois No. 6 bituminous coal converted 17.5 % to liquid products. Brazilian coals were extracted by supercritical ethanol with a recovery of >40% of liquid and gaseous products. Bio-active products are apt to decompose at very high temperatures, hence supercritical extraction is replaced by pressurized liquid extraction (PLE) or accelerated solvent extraction (ASE) with subcritical hot ethanol at elevated pressures. Anti-oxidants, such as carotenoids and polyphenols from microalgae, have been obtained by the PLE technique: at 383 and 443 K from spirulina platensis, at 313, 373 and 433 K from dunaliella salina, and at 323, 373, 423, and 473 K from haematococcus fluvialis. An increase in the temperature enhanced the yield but was deleterious to the antioxidant activity. Application of pressurized ethanol to olive leaves at 423 K and to spent coffee grounds at 468 K produced polyphenolic antioxidants and extraction of anthocyanin antioxidants from Brazilian jabuticaba skins required pressurized ethanol at 5 to 15 MPa and 313 to 393 K. Ketones of polycyclic aromatic hydrocarbons were obtained from contaminated soil by PLE with ethanol at 373 K and 15 MPa. All these examples reflect the desirability to know the (partial or even only the total) solubility parameters of ethanol, whether sub- or supercritical, for the prior estimation of its suitability for the planned extraction. The corresponding values for the potential solutes are generally available in the literature. 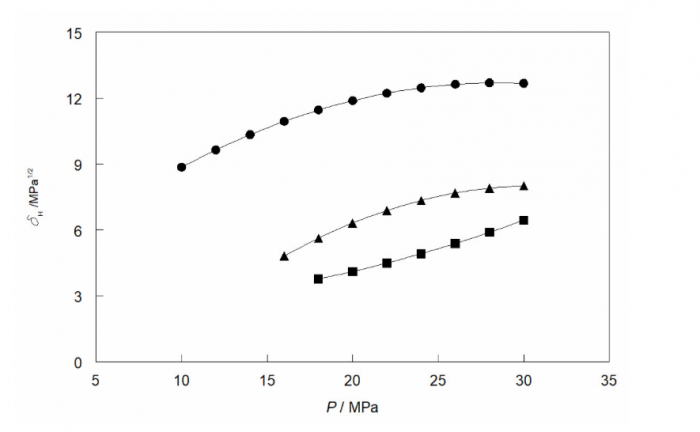 These findings are described in the article entitled Total and partial solubility parameters of sub- and supercritical ethanol, recently published in the Journal of Chemical Thermodynamics. This work was conducted by Yizhak Marcus from The Hebrew University of Jerusalem. Yizhak Marcus is a professor emeritus of chemistry at the Hebrew University of Jerusalem and active in research at the age of 87. He is also an artist and had several exhibitions of his paintings.